Here's where we've been. Highlights where available. Saticoy plays last (around 9 p.m.) but come early to catch Gwynne Garfinkle and Adam Marsland, among others. And: a special showing of the Fractal Universe Show, a series of old-fashioned mind-blowing video projections depicting chaos and order by programmer and visual artist Phil Harvey. Another short but sweet set with brand-new tunes! Billed as "A Day of Peace, Art & Music," the Sun Gathering features us, Anny Celso, Sam Lupides and other Special Guests! Check us out with Keith Walsh Experience and Pleasant the Meaner at this classic local hangout. Saticoy presents the briefest of sets (blink and you'll miss it) during the Angeles Bohemios Café Broken Mic show honoring Sunset Junction. We go on around 3 p.m.
Saticoy & Friends bring you an evening of music  Jeff Merchant (of the Lullabies and PG-13) at 9 p.m., Saticoy at 10 p.m., and Lemon Joy at 11 p.m.
Saticoy & Friends bring you an evening of music  Keith Walsh Experience at 9 p.m., Saticoy at 10 p.m., and Mark Fletcher (of the California Navels) at 11 p.m.
Saticoy & Friends bring you an evening of music  Jeff Merchant (of the Lullabies) at 9 p.m., Saticoy at 10 p.m., and Michael Whitmore (of the Lullabies) at 11 p.m.
Three days! Eighteen bands! Twenty-four hours of all original music! Saticoy plays on the final day of this three-day music concert benefitting the Santa Monica Playhouse. Eagle Rock's classic local hangout rings in "The Longest Day of the Year" with a Keith Walsh Presents evening featuring Saticoy, Keith Walsh Experience and Pleasant the Meaner. 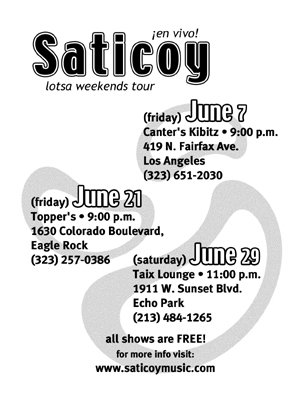 Since the Lakers look to be done on Wednesday, Saticoy agrees to play a gig this week after all. Rodolpho's has a $7 cover, but if you bring a printout of this web page or our e-mail invite, it's only $5! Score some sushi downstairs, then bring it upstairs to the Kabuki theater and enjoy some live Saticoy - we'll be doing the same thing too! Also on the bill is the incredible Michael Whitmore. Saticoy partakes in the Songwriter Strumble, webcast live. Saticoy presents its newest member  Alejandra on drums! Saticoy, with Keith Walsh Experience and Brandt Shandera, brings the groove to Westwood Village. Saticoy exécute un ensemble de chansons spécial à ces historiques restaurant et club français. Saticoy ventures into some new and interesting territory. Playing with us are the Keith Walsh Experience and DJQ. Saticoy performs with Boll Weevil and Phillip Rogers at Hollywood's notable Irish pub. Saticoy, with Keith Walsh Experience, Betty Dylan, and Earfood, performs on the Friday before Halloween at CIA club, a self-described "multi-dimensional art venue and circus museum."